Roam through nature on foot or on bike! 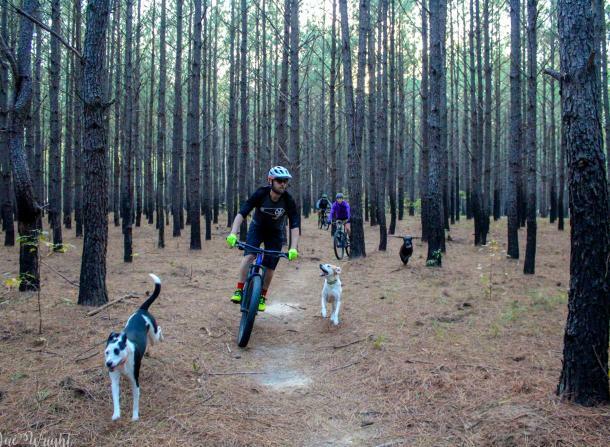 Located just a few miles outside Milledgeville, Bartram Forest offers outdoor enthusiasts three looping trails through pines, meadows, across a creek and alongside a pond. The three marked routes are a GREEN - beginner friendly singletrack at 5.5 miles, BLUE - beginner and intermediate singletrack loop at 7.5 miles, and RED - singletrack and doubletrack loop at 10.3 miles. The trails are perfect for biking, but they are also perfect for a nice run or walk. Grab a friend and bring your dog for a fun day exploring the trails. Bartram allows visitors not only to explore on trails, but a pavilion and education kiosks allow for places to relax and take in the scenery, bird-watching, natural wildlife and wetlands. In 1794, the Bartram Forest was inhabited by Native Americans. Today, educational hiking trails allow visitors to see centuries of abundant wildlife, natural wetlands, and an erosion ravine with soil that is a remnant of the ancient shallow seas that covered Georgia 50 to 100 million years ago. Bartram Forest Wildlife Management Area is a 1,343-acre property provides archery hunting opportunities for deer, turkey and small game. Gates may be opened or closed at the discretion of the Georgia Forestry Commission. No camping allowed on the WMA.